I ne wot non in wood no ris. And sweter be the birdin that hangis upon thee. I know not of, in wood nor copse. And sweeter is the burden that hangs upon thee. The manuscript in which this verse is preserved belongs to Merton College, Oxford, and you can look at the page of the manuscript on which the verse appears right here. It starts on the second line down from the top of the second column, following immediately on from the same verse in Latin (the first line of the second column begins 'Dulce lignum'). 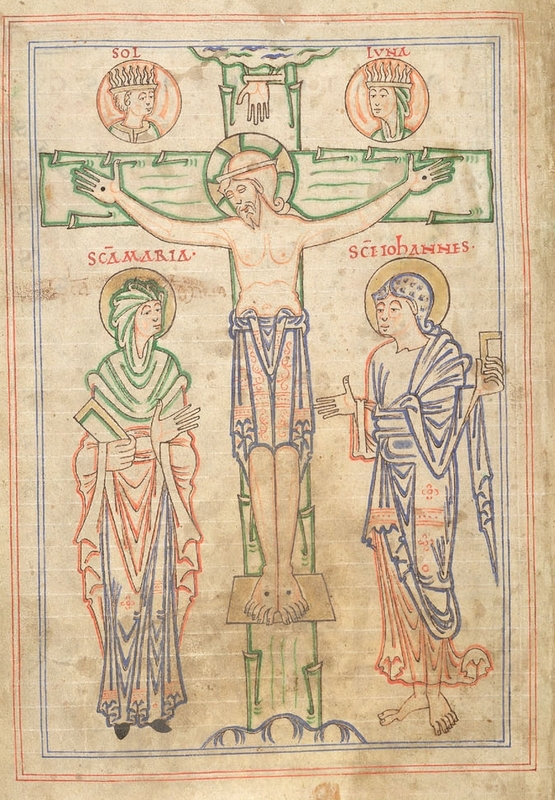 The manuscript originally belonged to John Sheppey, Bishop of Rochester, who died in 1360; it contains sermons in Latin by Sheppey and other preachers from fourteenth-century Oxford, and the sermons are interspersed with English verses like 'Steadfast cross'. Preachers like Sheppey regularly used bits of English verse in their sermons - and in the case of friars like William Herebert, whole translations of Latin hymns. (If you can make any sense of the manuscript page, you might be able to see that the text which follows it is a translation of 'Ave maris stella'). fall to the ground; I had to stand fast." 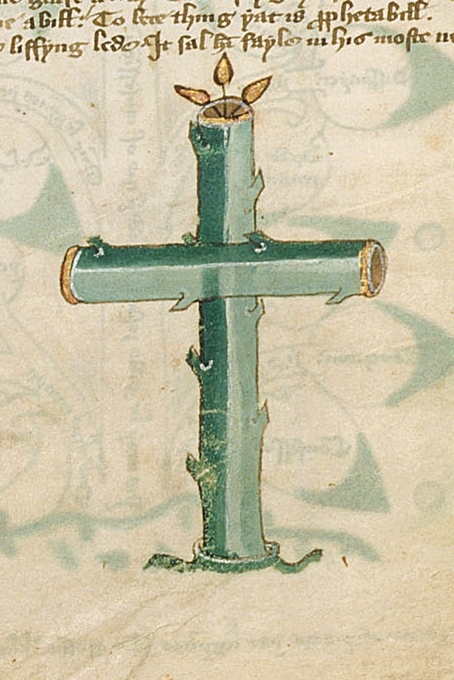 Forced to take a part in his Lord's destruction, the loyal Cross is shaken but stands firm; the disciples flee, and he alone is steadfast, rooted in position. I don't think the Dream of the Rood's unforgettable half-line - hwæðre ic fæste stod - could have influenced the choice of adjective in the Middle English verse, but it's a happy accident. And yet it's not surprising, because standing fast is one defining characteristic of the cross, 'the still point of the turning world': Stat crux volvitur dum orbis, the cross stands while the world turns. 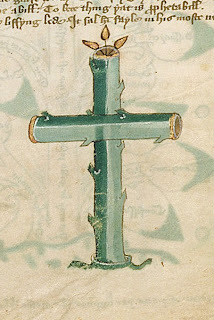 These crosses look so simple, but we know that Anglo-Saxon crucifixes could be incredibly elaborate. 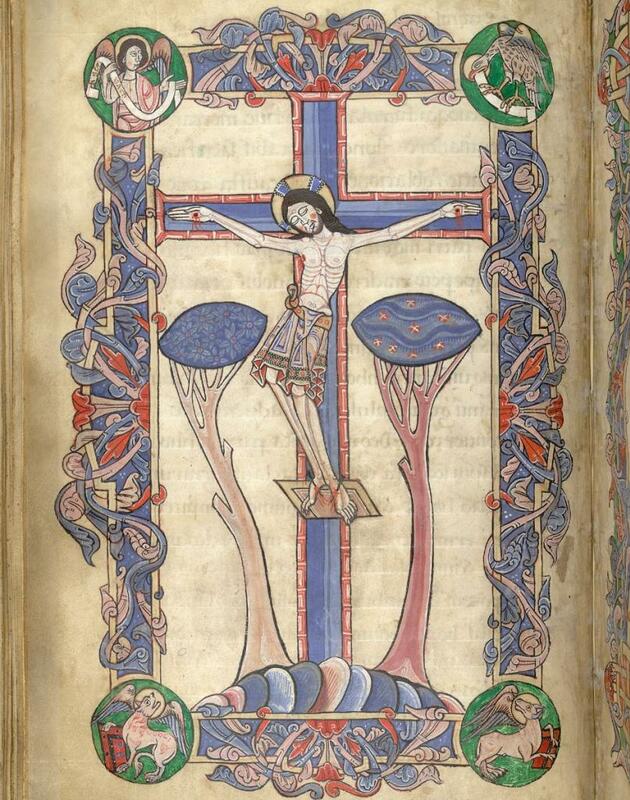 The speaking cross in the Dream of the Rood is adorned with gold and gems, streaming with colour, and so large that it stretches from heaven to earth. If the cross would protect one at the hour of death or – as the poet of The Dream of the Rood saw it – would fetch one to the next world, what better gift could one make to a church than a cross or crucifix? 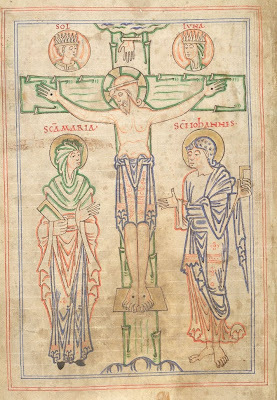 Æthelwold gave three crosses to Peterborough ‘for the redemption of his soul’. Byrhtnoth gave two gold crosses to Ely for burial rights just before the battle at Maldon in which he lost his life and King Eadred bequeathed two gold crucifixes to Winchester for the same purpose. 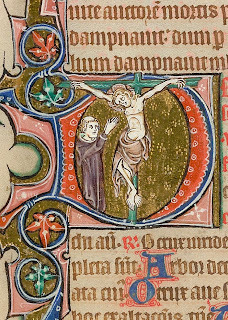 Cnut, who was buried in the Old Minster, gave a large cross to the New Minster; the picture recording this gift forms the frontispiece to the monastery’s Liber vitae. 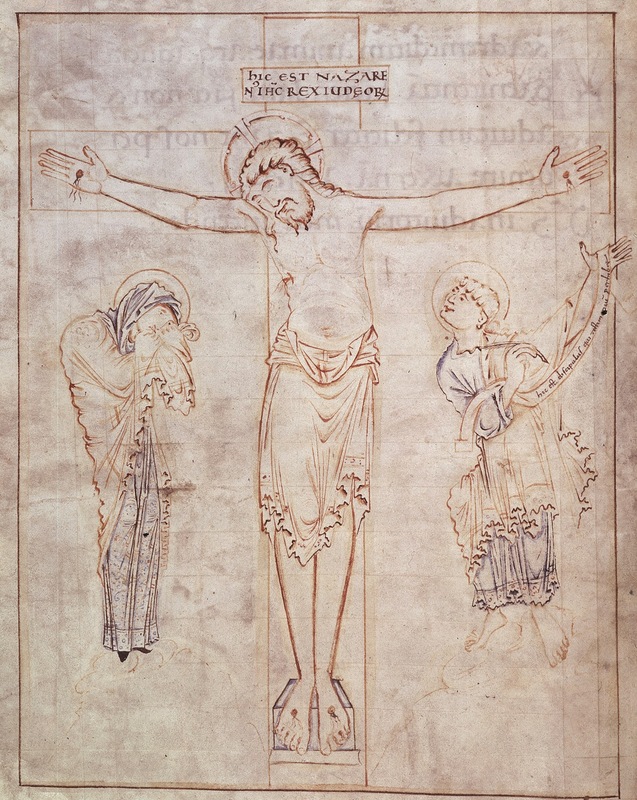 Quotations from Barbara C. Raw, Anglo-Saxon Crucifixion Iconography and the Art of the Monastic Revival (Cambridge, 1990), pp.40-2, 45-6, 63. 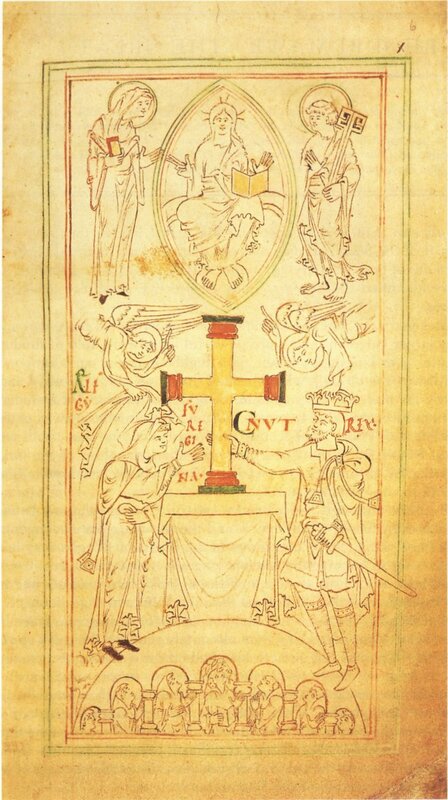 It dates to c.1031, and it shows Cnut and his queen Emma at the height of their glory: they interact with Christ and the saints and angels above them and with the monks below, the cross standing at the centre, at the very intersection of earth and heaven. 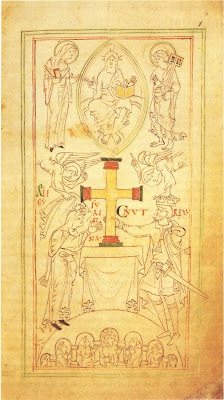 On another occasion, Cnut presented his own crown to a figure of the crucified Christ; later legend said he did this after demonstrating that he could not control the waves, because, he declared, "there is no king worthy of the name save Him by whose will heaven, earth and sea obey eternal laws". As late as the fifteenth century, Winchester believed it was in possession of the crucifix bearing Cnut's golden crown. Such figures, by virtue of their size, possess a presence that is almost human, and people did indeed interact with them as if they were living beings. There are various stories of these figures speaking or coming to life to intervene in human affairs. 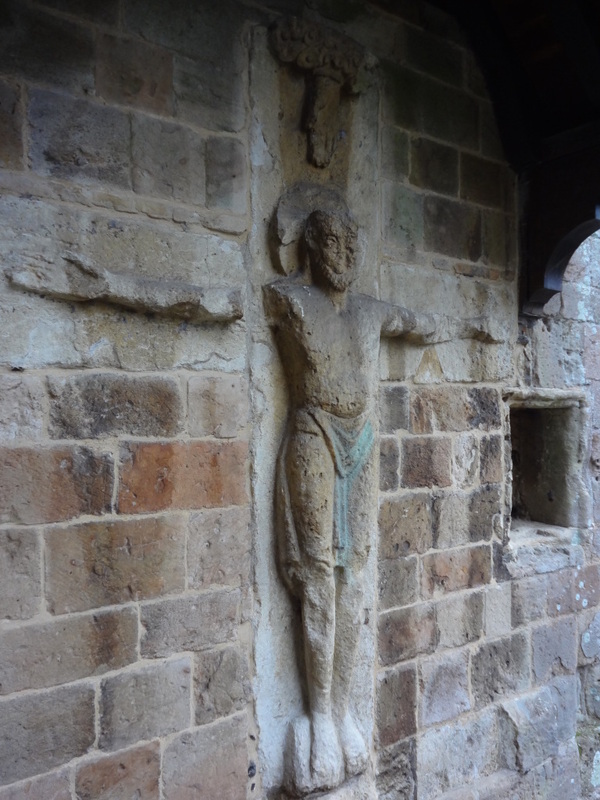 A legend from Abingdon Abbey tells how when a group of Vikings had plundered the monastery and were sitting down to dine in the monks' refectory, the figure of Christ on a crucifix was so enraged by their intrusion that it came to life and with miraculous strength pulled stones out of the wall (! ), pelting them at the Vikings, who fled in terror. 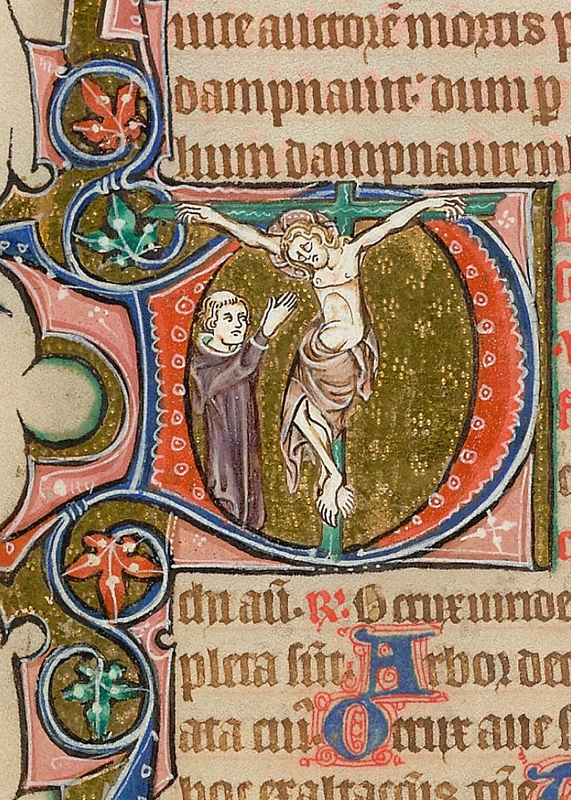 An eleventh-century story about St Dunstan says that once when Dunstan was in council with the king and nobles at Winchester, arguing for the rights of monks over corrupt clerics, an image of the crucified Christ suspended high above their heads suddenly spoke up on his side, and won him the debate. Most famous and most touching is the story of Harold Godwineson's interaction with the 'Black Rood' of Waltham Abbey, a life-size figure of Christ made of black marble. 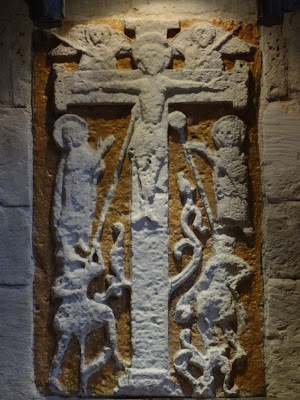 This had supposedly been dug out of the ground in response to a miraculous dream-vision in the second quarter of the eleventh century (which would date it around the same time as the Romsey crucifix and the illustration of Cnut's gift; I posted about its discovery here). The Danish lord who owned the land where it was found, Cnut's standard-bearer Tovi, girded his own sword around the figure, and his wife adorned it with gold made from her jewellery. King Harold was a patron of Waltham, and had a special devotion to the Black Rood. 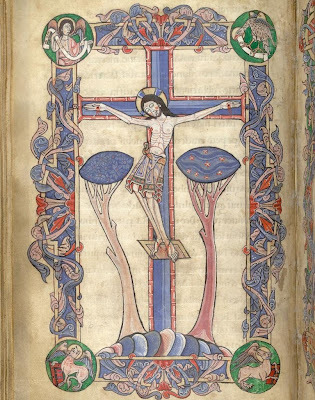 When he was on his way from the Battle of Stamford Bridge to Hastings in 1066 he stopped at Waltham and humbly prostrated in prayer himself before the Rood, arms outstretched in the form of a cross. The Waltham Chronicle records that the sacristan, busying himself putting away things on the altar while the king prayed, saw that the figure of Christ bowed its head to ill-fated Harold as if in sorrow, grieving for what it knew was to come. [Harold] had entered the church of the Holy Cross in the early morning, and placing upon the altar relics which he had with him in his chapel, he made a vow that if the Lord granted him success in the outcome of the war he would endow the church with a large number of estates as well as many clerks to serve God in that place, and he promised to serve God in the future like a purchased slave. Accompanied by the clergy, and with a procession leading the way, he came to the doors of the church where, turning towards the crucifix, the king in devotion to the holy cross stretched himself out on the ground in the form of a cross and prayed. Then occurred an event pitiable to relate and incredible from an earthly point of view. When the king bowed low to the ground the image of the crucified one, which had previously been looking directly ahead above him, now bowed its head as if in sorrow, a sign portending what was to happen. Turkill, the sacristan, testified that he had seen this while he was himself collecting together and putting away the gifts which the king had placed on the altar, and that he told many people about it. I heard this from his very lips, and it was confirmed by many bystanders who with their eyes saw the head of the figure upright, though none of them except Turkill knew the moment it had bowed. 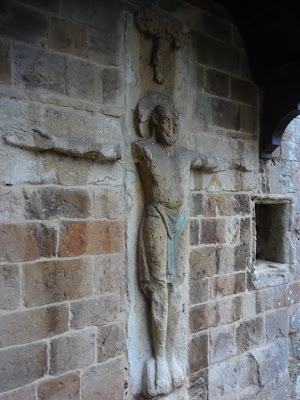 The Waltham Chronicle: an account of the discovery of our holy cross at Montacute and its conveyance to Waltham, ed. and trans. Leslie Watkiss and Marjorie Chibnall (Oxford, 1994), p.47. Harold went away to fight at Hastings and the next time he came to Waltham, it was to be buried. It's hard not to be reminded again of The Dream of the Rood, and the steadfast cross standing fast, powerful in its passivity, witnessing with almost overpowering emotion events it can but will not alter. I was glad you posted this last week, as we skipped the observance in chapel (due to some school event I have already forgotten) and I would have missed it. I wonder if the 14th century translation is available in full somewhere for those of us who are not terribly skilled at middle English? That's the whole thing - just the one verse.